1. 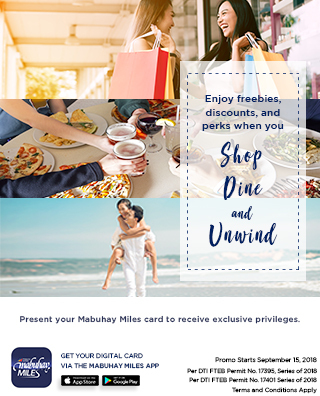 Customers must present their Mabuhay Miles membership card (Physical or Digital Version, Mabuhay Miles Travel Card, PNB Mabuhay Miles Credit Card), together with a valid ID to avail of the 10% discount on regular-priced products and services at participating Skin Station branches. 3. Discount can be availed from March 15 to September 14, 2019 only. 4. Discount does not apply to medical products, TCA Peel, TCA Cross, Acne Injection, special promos and packages including but not limited to Senior Citizen or PWD discounts. 5. Mabuhay Miles card holders can also avail of Skin Station's expired regular promos and packages prior to the promotion coverage. Per DTI FTEB Permit No. 4710, Series of 2019.